It all made too much sense, but was never made official until Thursday afternoon, but now you can rest assured that Rangers ace Cole Hamels will start two more times against the Houston Astros this year and be ready to roll, if needed, for the AL Wild Card Game on Oct. 6, or if all goes well, Game 1 of the ALDS on Oct. 8. 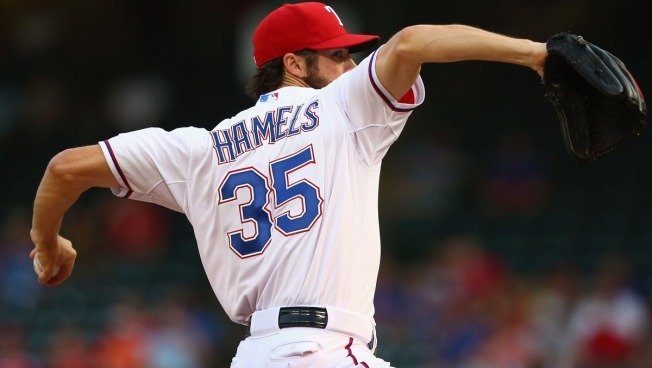 The Rangers made the decision to push Hamels back a day from his next scheduled start on Sunday at home against Oakland to start Monday at home to open a pivotal four-game series against the Astros. To do that, they'll recall Chi Chi Gonzalez, who will start Sunday against the A's. The move allows Hamels to pitch the opener of both series this month against the Astros — on Monday at home and then on Sept. 25 in Houston — as well as be on schedule to start the first postseason game the Rangers play, should they qualify. Hamels hasn't faced Houston yet this season and has never faced many of their hitters, so it ought to give him a leg up in those two starts. Of course, it's great to have Hamels in line to open a postseason given his great track record in the postseason (3.09 career ERA in 81 2/3 postseason innings) and his NLCS and World Series MVP trophies from 2008.